A paradox is something that seems self-contradictory or absurd but in reality expresses a possible truth. Its apparent self-contradiction can generate a tension so strong that it snaps and collapses into a dualism of either this or that, this versus that, this but not that. In a paradox, this and that are held as complementary in a larger truth that can be appreciated only as their tension is preserved. The paradoxical nature of education is suggested already in the very definition of the word. Very simply, to educate is “to lead out.” From the Latin educere, it can refer to “leading” a mind “out” of ignorance and into knowledge, or to “leading” the deeper intelligence and native talents of mind “out” of dormancy and into actualization. Which is it? If we can honor the paradox, it is both. But the paradox of education has not been honored, particularly in the West where the operating assumption is that what we need to know and know how to do, if we have any hope of making it in this world, is something we need instruction in. Our natural ignorance must be dispelled with the information and techniques that make society work. Otherwise we will be left in a ‘state of nature’ with the beasts, infants, and idiots – ‘blank slates’ forever. In a way, this preference for technical knowledge over self-actualization, for mastering the outer world over nurturing our inner spirit, plays out in “the two cultures” (C.P. Snow) of Western education, with science, technology, engineering and mathematics (STEM) on one side; the humanities, the arts, religion and philosophy (HARP) on the other. Because STEM prepares students for professions in the industries driving our world economy, and while HARP amounts to a major distraction from real-world concerns, the Western curriculum in recent decades has been steadily shifting away from spirit and more to machines, out of feeling and more into thinking – more and more into facts, data, analytics, and the technical skills that society depends on. As the gap widens, a general appreciation for and even an understanding of our own inner life is rapidly diminishing. Working in higher education, the human cost of this shift is painfully obvious. As the process of education gets reduced to classroom instruction, standardized testing, grade rubrics, academic interventions, and remedial accommodations, students themselves get left out. It may appear as if students are the principal value, but in actuality they are little more than an ID number, a GPA, a graduation and job placement statistic. An expert stands at the front of the room and all the blank slates are arranged in straight rows, facing forward, passively absorbing the data-stream. More students than ever before are succumbing to boredom, depression, anxiety, and the autoimmune complications that fall out from these. It might sound as if I’m advocating for more art and music in our schools, and while I think that would be a good thing, it’s not the point I’m making here. The leading-out-of-ignorance and leading-out-into-expression models of the educational enterprise are not mutually exclusive, as my argument for their paradoxical relation suggests. It’s not that STEM aligns with the first model and HARP with the second, and that we need more HARP to fix our problem. Our current crisis in education cannot be reduced to the disappearance of performance studios and the proliferation of laboratory classrooms. As paradox, education is both about preparing students for the workaday world of adult life and assisting in their self-actualization as human beings. When a paradox is functionally intact, the tension generated between its internal poles is apprehended by our minds all at once, as it were. It is one thing – paradoxically. But after its tension snaps and this unity collapses, repairing a paradox to its original state isn’t simply a matter of gluing the pieces back together. As in all dynamic unities, the whole is always more than the mere sum of its parts. So too, an active paradox is one plus one … plus. For education, I believe this non-added ‘plus’ is its soul, now lost. In the nursery rhyme, Humpty Dumpty is depicted as a big egg who falls from atop a wall and breaks into pieces. “All the king’s horses and all the king’s men couldn’t put Humpty Dumpty back together again.” Our solution for education will not come by tape and glue; we need to contemplate the chicken (unacknowledged in the rhyme) that came before the egg. We should agree that education is not only a matter of preparing future employees for the job market; it is also about developing human beings. When the paradox snaps and the process becomes one of filling blank slates with the technical information and employable skills they will need to punch clocks and pay taxes, we stop teaching students how to think and start imposing an orthodoxy of what to think. It’s a short but precipitous slide from there to standardized testing, academic failure, and the crisis we have on our hands. When I consider the soul of education, what I’m getting at is the deeper spiritual source out of which human consciousness, thought, feeling, desire, and intention arise; it is the grounding mystery within. 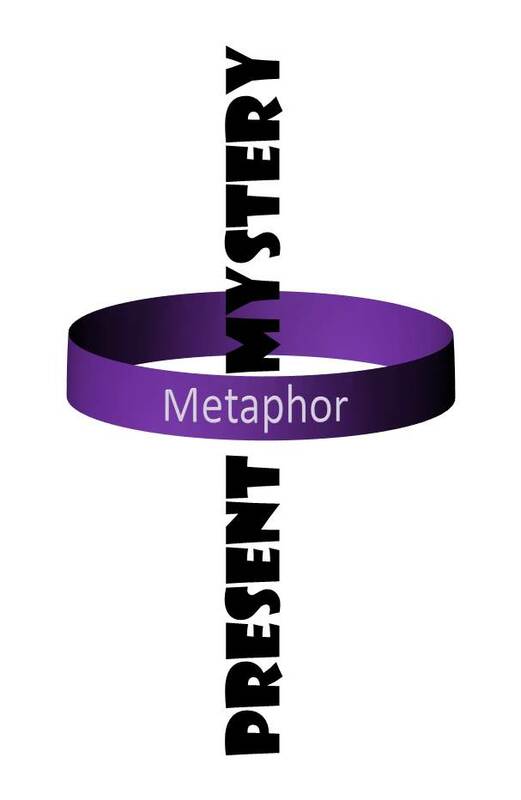 My reader needs to know that I attach no metaphysical status to this grounding mystery: it is neither some thing or some place, nor can we properly say it exists on its own. It is not god – although I do regard the grounding mystery as the inspiration behind our best metaphors of god. Finally, in calling this deeper source spiritual I am not thereby setting it apart from the physical realm and our animal life, as in the classical separation in religion of ‘soul’ from ‘body’ – yet another symptom, along with our current malaise in education, of the Great Collapse. In the diagram above, I offer the image of a tree to illustrate what I mean by the soul of education. My use of an organic metaphor rather than a mechanical one is intended to make the point that education is a living enterprise; it is dynamic, vibrant, and constantly evolving – or it could be, and hopefully will be again one day. Just as in the life of a tree, there is directional flow in the life of education, which I represent in the four terms arranged around the tree. The place within, where the grounding mystery – that wellspring and spontaneous stream of consciousness – first crosses the threshold from ineffable experience into the articulate network of language, is our imagination. 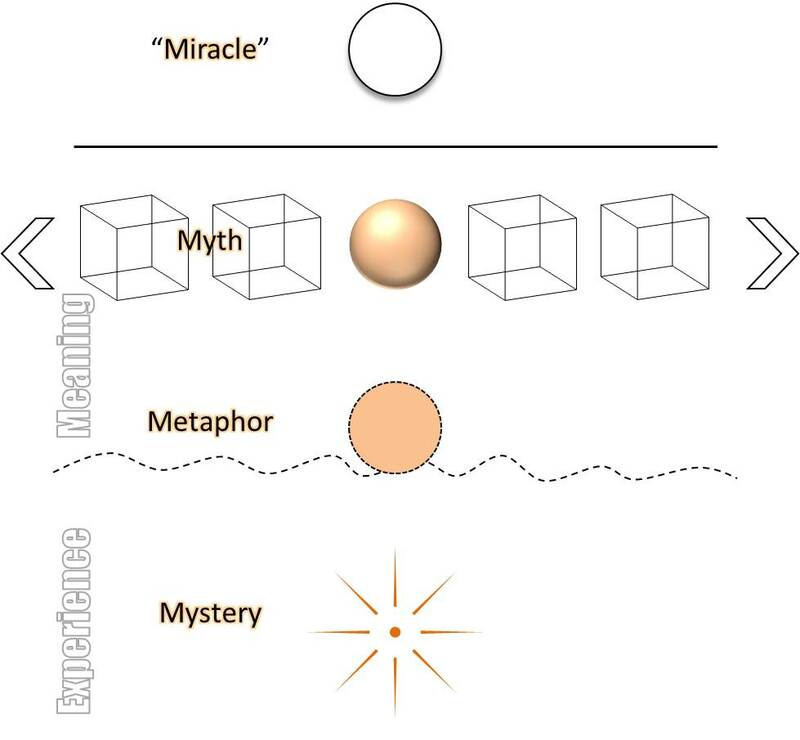 Metaphors (from Greek, meaning to “carry across”) quite literally are preverbal images that translate experience into meaning and serve as foundational insights into the nature of reality. Imagination is perhaps what makes us most uniquely human, and its death is the moment when education begins to lose its soul. These primordial images rising out of the metaphorical imagination stimulate a more conscious creativity, enabling us to see beyond the given facts into a wider range of probabilities, hidden frontiers of possibility, and even into what is only conceivable but not (yet) possible. Human creativity is a productive and prodigal force in the universe, generated by a powerful urge to simply bring forth and realize what is within us. When it gets blocked, stifled, or penalized for not staying inside the lines, the consequence is spiritual frustration and all the psychosomatic illnesses that Western medicine refuses to validate. When creativity is allowed to flow and the imagined possibilities can continue to evolve, the wonderful outcome is innovation: bringing about something utterly new. What do we see when we consider human culture – its hardware in the infrastructure, architecture, art, technology, clothing, costumes, uniforms, utensils, instruments, tools, machines and all the rest? And what about its software in the languages, disciplines, theories, paradigms, belief systems, codes, laws, principles, ideas, and ideals that comprise our many systems of meaning? These things are not mere facts of nature but artifacts of culture, and all of them started as innovations of human creativity. 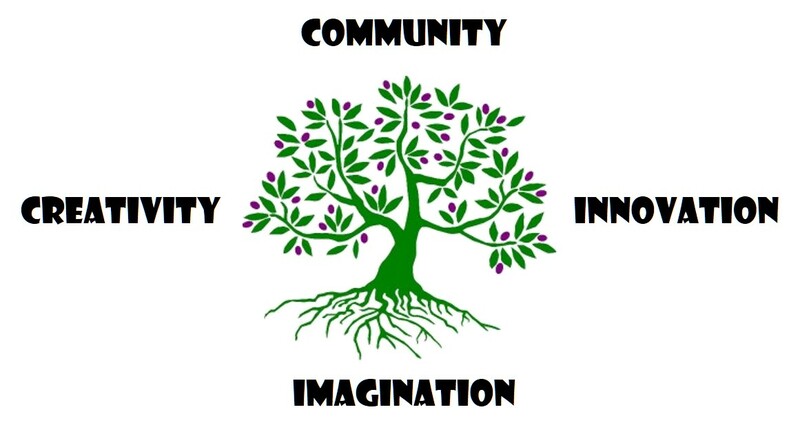 Community in this sense serves as an incubator of innovation, a provident support for creativity and a deep engagement with the metaphorical imagination. It is itself a manifestation of all this magic happening deeper down, even as it holds sacred space for the magic to happen. In my view, this is what education is and what our schools should be doing. We need to become communities of learning by restoring the paradox of education and recovering its lost soul. What’s your message? 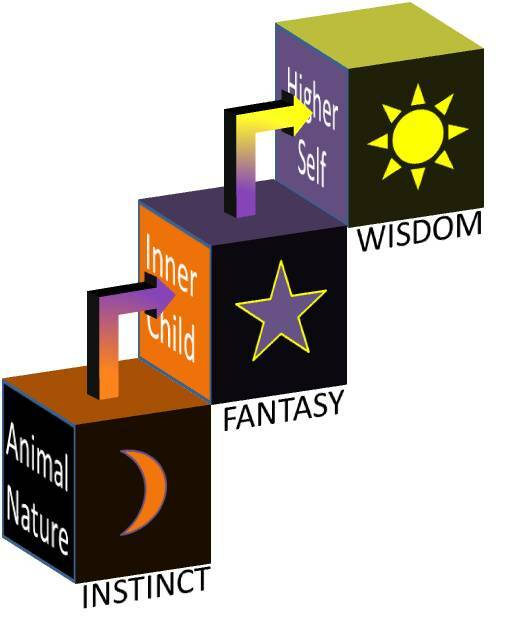 What philosophy of life – theories, beliefs, values, and aims – do you live by? Each of us has a message, a personalized interpretation of what life is about, what really matters. Some of us are more consistent in the way we put our philosophy of life into practice, and some philosophies of life are more thoughtfully composed than others. But we all have one – or I should say, each of us has one, which means that all of us taken together represent billions of different messages concerning the nature of reality, the purpose of existence, the meaning of life, and how we ought to live. If we shift focus from individuals to societies, we can see that entire groups of people are characterized by the messages of their respective traditions. There’s a Christian message and a Buddhist message, and inside each we will find variations on the principal message: Roman Catholic, Baptist, Evangelical or Progressive Christian; Mahayana, Theravada, Zen or Pure Land Buddhist. These group-level distinctions are more numerous than you might first expect, and the variations on a message will multiply exponentially the deeper we look, until, once again, we find ourselves face-to-face with this individual Christian or that individual Buddhist (or whatever brand of message we happen to be considering). Any message (at whatever level) can only speak out of the range of experiences informing it. No human being can hold everything inside his or her frame of reference, and even when we adopt someone else’s message into our own, we are unable to escape the limitations inherent to just having a perspective. Some cultural messages, like the religions mentioned a moment ago, claim that their perspective on reality was revealed to them by someone who did (or does) in fact comprehend everything in a limitless perspective, which is a contradiction supernaturally transcended in this case. But you have only to study it in closer detail to discover that their so-called revealed message carries assumptions about the universe that are millenniums out of date, along with ethical values and directives that today many regard as barbaric at best. Even if their message once had the mystique of encompassing all of reality, it’s obvious now that it cannot – and didn’t back then, either. So all of us carry messages that articulate a philosophy of life, conclusions and conjectures that orient us meaningfully in reality. My message is not exactly the same as yours by virtue of our different backgrounds, histories, situations and personalities (to use very broad categories). And neither of us holds the same philosophy of life today as we did, say, ten years ago. The slow process of maturity changes us, and along the way we come upon opportunities, suffer losses, and learn things that our former self could not have imagined or wished for. So many messages, so many different philosophies of life might inspire a more thoughtful exploration of meaning, if only we could get past the outer orbit where we all are promoting our messages as the best or only right one. But let’s say for now that we can. If there are so many variants in how human beings interpret reality and make sense of things, what can be said about the nature of meaning itself? If you have yours and I have mine, then at least we should be able to agree that meaning is more complex than our divergent messages would have us believe. Indeed, the “meaning of life” that each of us is busy constructing is incapable of being reduced to a publishable message. There is just too much information, too many angles and perspectives, too many different ways of arranging and connecting the countless points of human experience, to break it all down into a single exhaustive philosophy of life. If we can step deeper into the complexity of what we might dare call THE human experience, we have to be willing to leave behind the either/or logic of competing messages and develop a tolerance for paradox. It is possible that your message and mine are two legitimate spins on the meaning of life, constructed out of two distinct vantage points on the present mystery of reality and generated out of experiences that are deep-down unique according to the specific conditions that make us two different individuals. Our competing messages or philosophies of life may be irreconcilable, but perhaps all our efforts at negotiating a total agreement or eliminating our competition are fundamentally misguided. We are finally coming to understand that our ambition for one supreme and absolute message will most likely lead to our collective extinction. Meaning, then, has to do with the haphazard and more intentionally systematic ways that human beings select from the moving stream of experience those sensations, impressions, and patterns that correspond to the apparatus of our nature as sentient beings. We “tune into” reality along frequencies matching our human needs for safety, nourishment, intimacy, identity, freedom, purpose and significance. It’s that last (and highest) need, for significance, which drives our incessant activity of meaning-making: constructing a “world” and composing a philosophy of life (our message) that will orient us meaningfully in reality. The construction of meaning begins in the act of reflecting on experience and forming a mental image that depicts it internally to the mind. As we would expect, the images which first ascend into consciousness are generated out of the primary experiences of being in the provident garden of our mother’s womb, falling out of union and pressed through a narrow passage into exile, thereafter compelled by the pang of need to find the sustenance, protection, and warm bonds of security that will ensure our survival. Because they provide this bridge from direct and spontaneous experience into the organized construction site of our world, these reflex images are known as metaphors (from meta, across + phorein, to carry). Not to be confused with the similes and analogies by which we compare and make sense of things we know in other ways, metaphors operate as grounding for language, anchors that tie our otherwise free-floating world systems to the present mystery of reality. When they are engaged (typically at deep intuitive levels), these images draw consciousness down to its source. Rather than representing something (some thing) external to the mind, an archetypal metaphor is a “dark depiction” of our own essential ground. And what is this ground exactly? We can’t say, for the simple reason that its reality as the ground of being is deeper than words can reach. 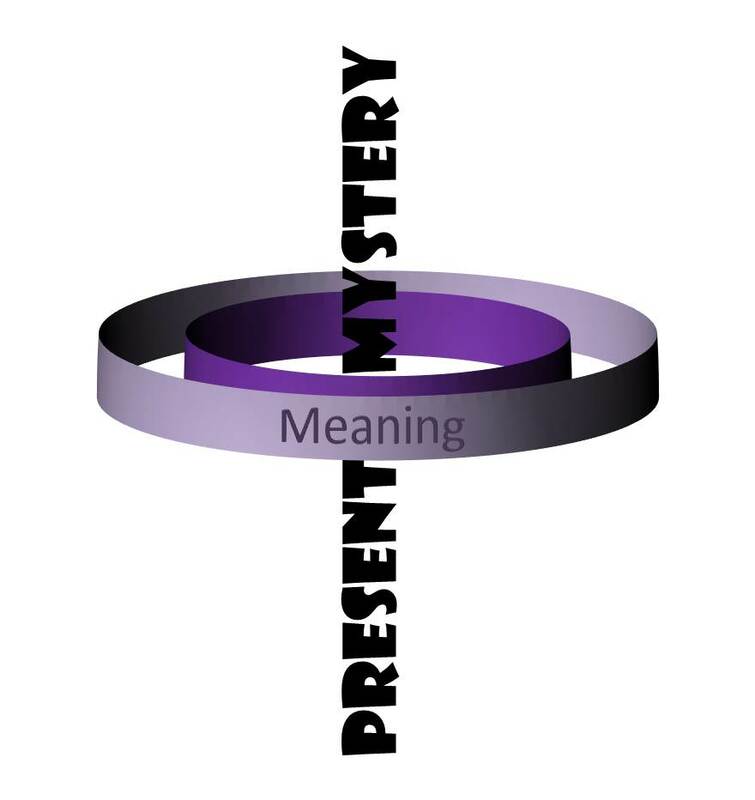 Once the threshold between meaning and mystery is crossed, in the direct and spontaneous experience of reality, we leave meaning behind and enter the ineffable presence of being-in-the-moment. Not a being, but being-itself. This is where everything begins – not in the once-upon-a-time sense of begin, but as the timeless source of your existence in each moment. The present mystery of reality, which might also be named the Real Presence of Mystery, is evident all around you in its countless manifestations. 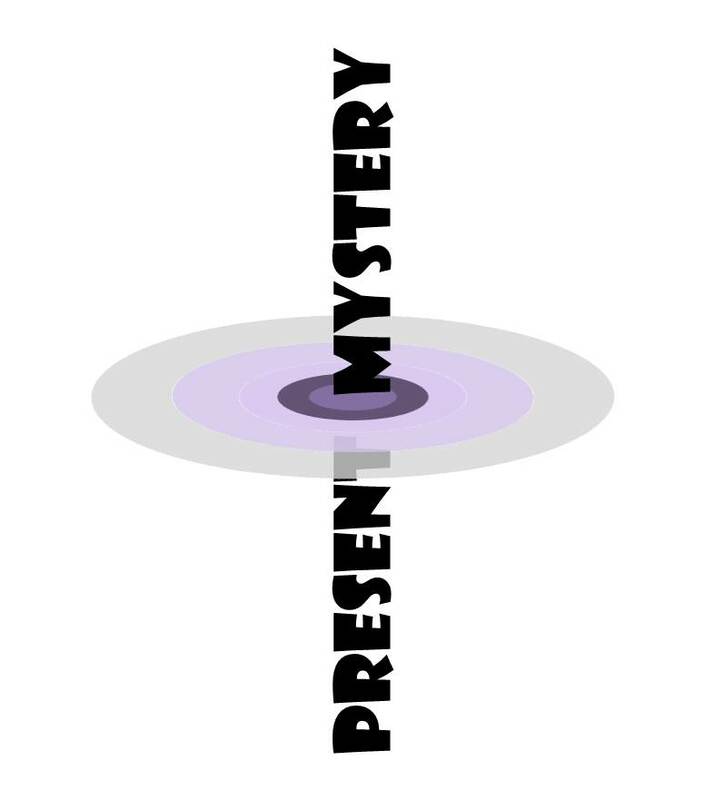 As one of these manifestations of the present mystery, you also have the opportunity to descend through the interior of your own being, into deeper and deeper registers of contemplative experience until, releasing the last (which were really the first) forms of self-definition, awareness breaks through to … this. We can review the long history of religion as the pouring-forth of mystery into meaning, and meaning into the numerous messages or philosophies of life encircling our planet today. With so many parties and denominations calling at us to join in agreement and have a seat in the sanctuary, more people than ever before are feeling lost in the message. So much of it leaves us baffled, but also slightly offended at the demand that we distrust ourselves and let someone else do our thinking for us. More people now than ever are seeking to push through the mob of placards and pickets, ready even to drop their own heart-crossed creeds in the quest for a deeper truth. Because they are straining against the outflow of world construction that’s been going on for many generations, the effort and intention of these seekers is interpreted by the custodians of orthodoxy as defiance, disobedience, and rebellion. But they are not interested in anarchy. They aren’t promoting atheism or dabbling in New Age superstitions. What they seek is Real Presence – in themselves, in their relationships and communities, in the way they live on the earth. For all I know, you may be one of them. The phenomenon of religion has evolved with the rise of human culture, perhaps going back millions of years to our hominid ancestors. Its function has always been to “link together” (religare) the separate concerns and activities of daily life in a coherent way by orienting it all around a single transcendent focus. “Transcendent” here doesn’t necessarily mean supernatural or metaphysical, but simply above and beyond the field of temporal attachments. 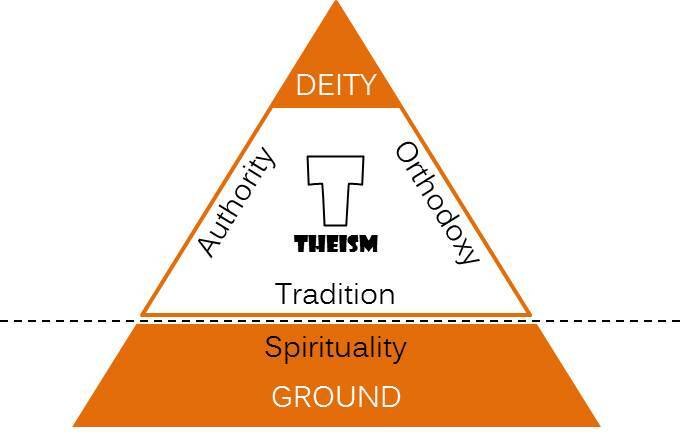 Theism is the standard and conventional form of religion, as it coordinates tribal life around a metaphor representing the provident power(s) behind the world as we know it. As a constructivist, I hasten to add that the so-called “world as we know it” is really a construction of our own minds – not the given sensory-physical realm outside us, but the layers of value, meaning, and significance that we weave around it. Like spiders we spin our web of language across the universe and call it home. The deity of theism – an agency of intelligence, personality, and will that might be represented in any number of human or nonhuman forms – is how religion depicts the provident power(s) on which our lives depend. Instead of being revealed to us through the clouds, as someone coming to religion from outside might assume, this deity is actually a kind of creative reflex of the mythic imagination. The many stories (myths) that together form the narrative fabric of human meaning (our worldview) are not eye-witness reports of supernatural encounters, but rather poetic-literary portrayals of the present mystery that gives us life, supplies our need, and receives our last breath. As societies grew larger and more complex, the tribal practice of reciting traditional stories and ritually participating in the life of god required institutional support. Certain individuals were elevated to positions of honor and authority by virtue of their familiarity with the deity. Or perhaps it was the other way around: individuals with social clout and community influence took on the mantle of high priest and presented themselves as ordained mediators between god and the people. As the sacrament of storytelling and ritual enactment became difficult to manage for a growing population, it was found that community agreement could be more efficiently achieved by converting this sacramental experience of god into a system of orthodox beliefs about god. My illustration above intends to show how, with the addition of an authority structure and an “official” orthodoxy, religion gradually pushed the providential metaphor of the deity out of its literary habitat (as the principal figure of sacred story), into a supernatural space outside the world, and farther away from the relevant concerns of daily life. And this is where we are today – arguing over whose deity is the one-and-only, trashing the earth, suppressing freedom and creativity, and thrusting our species to the embattled edge of oblivion. But don’t worry, if you’re on the right side your soul will be safely delivered to a better place far away. So whereas once upon a time religion could do its job by connecting individuals to one another in community and anchoring the community to a reality celebrated as provident, it slowly but surely removed its members from communion with the Real Presence of mystery and became instead a tinderbox of spiritual frustration, small thinking, moral regression, and redemptive violence. In the meantime this dysfunctional religion invented its own myth – now no longer in the traditional sense of a sacred story grounding us in a provident reality, but rather a narrative deception about our human fall from grace and into the hopeless condition of sin. The consequent “gap” between earth and heaven, nature and supernature, human and divine is characterized by rampant depravity and ignorance, veritably crying out for the authority and orthodoxy that religion itself provides. As a counter-voice of sanity, a growing number have been calling for the dismantling of theism, insisting that belief in god at this advanced stage in our history is not only unnecessary, but irresponsible. And not just irresponsible, but intellectually and morally backwards. While “atheist” used to be a label for one who refutes the existence of (a) god, it evolved over time into an outspoken defiance of god out of allegiance to human values. Today atheists join hands in solidarity against the abuses of religion, leaving its god to exist or not exist as a matter of indifference. In my defense of post-theism, I have frequently heard from conventional theists and atheists alike that my position is just a convoluted form of atheism. I’m really a closet atheist but just afraid to admit it to myself. To suggest that the mythological gods of religion are literary figures (in story) and not literal beings (in reality) is effectively denying the existence of god, is it not? Actually, the “after god” of post-theism is very different from the “no god” of atheism. While atheism commits itself to arguing against the literal existence of god (or living as if it doesn’t matter), post-theism regards the literary existence and mythological career of the deity as highly relevant to an understanding of our evolution as a species.The literary deity inspires us, calls to us, and places demands on us in order to actualize what is presently dormant, unacknowledged, or repressed in us. Yahweh, the biblical god of Jews and Christians, does not have to be real to be important. To say that Yahweh never spoke the universe into being, parted water, or raised Jesus from the dead in any kind of (as we might say) scientific-objective sense might sound as if I’m refuting his existence and seeking to undermine the religions founded on these doctrines – but I’m not. The literal existence of Yahweh is literally beside the point and outside the plot (mythos) where his truth as metaphor is found. As a constructivist I regard every picture of reality, even the scientific one, as a construct of our minds. Religious myths and scientific theories are merely two kinds of storytelling, the one (science) weaving narratives that explain the physical universe confronting our senses, as the other (religion) does its composing out of a more internal intuition of the present mystery that sustains us. Science joined the conversation around the campfire quite late, when religion had already been about the business of myth-making for many thousands of years. Its more detached and mathematical approach to things did in fact compete with religion’s sacred fictions of fabulous characters and miraculous deeds, convincing a growing number to abandon these tales as so much primitive superstition. 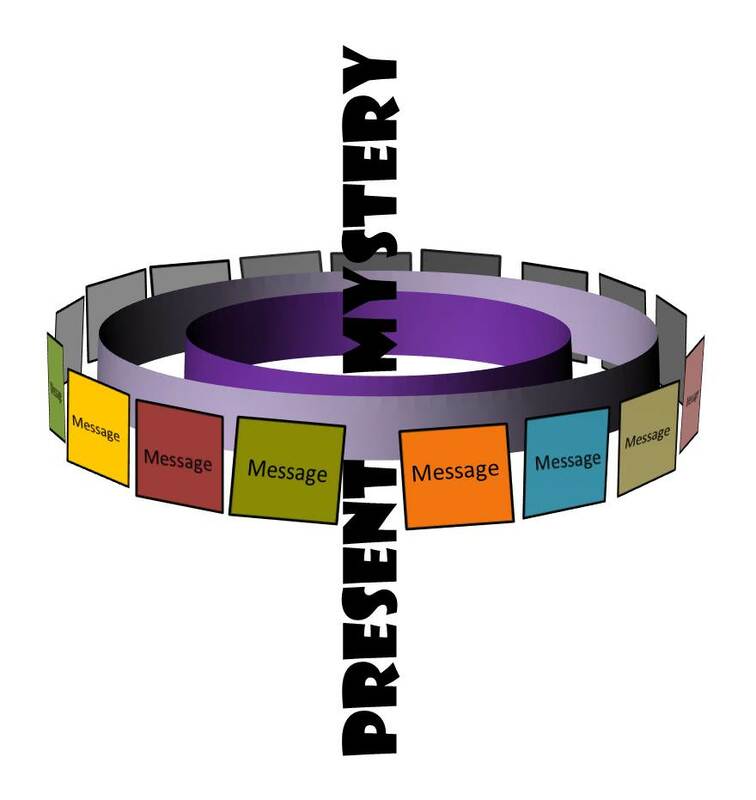 In the illustration above, the entire institution of religion rests on a foundation of spiritual experience – what I call the experience of mystery or the present mystery of reality. We are in this stream (a better metaphor than foundation, which suggests something fixed and unchanging) all the time, but we can only be aware of it now, in this very moment, for in the next moment this mystery will present itself to us afresh. Out of this experience of Real Presence, along with an exquisite awareness that it sustains us providentially in this moment, arise the metaphors of the mythic imagination. The deity is born, and just as suddenly we find ourselves engaged in a dialogue with the primordial support and deeper intention of our existence. Post-theism is the contemplation of what’s next (“post”), as we continue to grow Godward. Constructivism is an approach to understanding the world we live in as a product of our own creative intelligence. “World” refers to the habitat of meaning that human beings construct around themselves for security, to support identity, and to provide a sense of purpose to their lives. As a social species, humans are compelled to carry out this construction project in tribes and communities, where the larger world they share together is known as culture. This project of world-building has progressed apace with our evolution. Since earliest times, the spontaneous and ineffable mystery of being alive has been rendered in language first as archetype, then metaphor, myth and (quite a bit later) theory. These various conceptual devices (symbols and symbol systems) enabled our hominid ancestors to articulate an expansive and increasingly complex web of references, inside of which everything had meaning. In this blog I’ve been exploring creative change from a number of different angles. My philosophical preferences in this quest include (1) constructivism, (2) perspectivism, (3) metaphysical nonrealism, (4) evolutionary psychology, and (5) a mystical orientation that regards all of the worlds we make up (however meaningful) as nothing more than secondary qualifications on an essentially unqualified mystery – the moment-by-moment wonder of experience itself. Metaphysical nonrealism sounds more sophisticated than it really is. Very simply, it is an unwillingness (hence the “non” in nonrealism) to assume that the early stories of primitive and ancient cultures were based on what we today would call supernatural encounters with metaphysical realities. Just because a myth speaks of gods, devils, angels and disembodied souls doesn’t compel us to take them literally. Indeed, taking them literally is just as irresponsible – and I would add, intellectually lazy – as dismissing them out of hand as hallucinations or lies. A representation of god in a myth needs to be interpreted and understood within the story’s own web of references, and also, moving out into the larger worldview of its authoring culture, across numerous overlapping webs. Our assumption that these stories were reports and eye-witness accounts of real things (metaphysics) and actual events (miracles) is already “breaking the spell” of the story-telling art, which is about taking us inside and transforming consciousness. Tragically, an irreversible side-effect of mythological literalism is that it leaves the contemporary reader in a depressed state of disillusionment. No one today experiences god in the ways the Bible personifies him. No one ever has. But because we don’t, our only conclusion must be that we have fallen farther into sin, ignorance, and spiritual blindness. All the more reason to take the Bible literally and not question what we’re told. In the space I have left, I want to explore three distinct “powers” that correspond to these standpoints in reality. These powers might be thought of as three strands in a braid, complementing each other but also generating conflicts between and among themselves. Such conflicts, I would argue, are a key to appreciating the complexity, wonder, ecstasy and torment of being human. Body is your animal nature. The particular power-strand that resides there is instinct – the urgencies, impulses, drives and reflexes that are rooted in the very deep evolutionary past. Instinct is non-personal, which is to say that it has no concern for the personality. The moon is my symbol for it, representing the dark realm of our unconscious (and autonomic) animal life. Instinct carries on far below the light of conscious awareness. It comes before thought and precedes even feeling. If you didn’t have instinct, you would die. The countless events, urges and reactions in the biological foundations of your animal nature are regulated constantly for the primary purpose of keeping you alive. When your life is threatened – or you perceive it to be – strong and often irresistible reflexes and “gut reactions” move you to behave in a defensive, avoidant, or perhaps hostile manner. But you are more than a body. Because humans are a social species – collecting into clans and communities where resources can be shared, where the very young and the very old can find protection, and where world-building can begin – our hominid ancestors were faced with the challenge of channeling the dark powers of animal instinct into some kind of social order. This domestication required some impulses to be redirected into acceptable behaviors, while others were gradually “pinched off” through progressive discipline. Your childhood brought you through experiences highly unique to the interactions inside your family system. But however it went for you, one important outcome was the formation of your identity – maybe enmeshed, codependent or estranged in some ways, but an identity nonetheless. This is your ego, which during your childhood was who you were in your relationships with others. If you are now an adult, we can speak of this center of (largely emotional) identity, restraint, agency and ambition as your inner child. The power-strand corresponding to childhood, the ego, and your inner child is what I call fantasy. It is, very simply, the productive genius that enables you to make believe and pretend, to tell stories and still get caught up in them. My symbol for fantasy is the nighttime star, not like the shape-shifting moon pulling on sea and blood, but twinkling in constellations of mythic forms from the realm of story and dream. Even after you grow up, your story-telling inner child continues to compose the narrative plot (Greek mythos) of your personal myth. I don’t regard the ego/inner child as something that prevents you from what you are ultimately here to become or accomplish. Just as instinct is necessary for you to stay alive, fantasy is equally as necessary for you to have an identity and make meaning. You will be telling stories until you die. If you should stop telling stories before you die, you will likely fall into a suicidal depression and die anyway. The truth of your personal myth is measured by how much more awakened and genuinely human you become in telling it. One thing a child doesn’t have a whole lot of is experience – the months and years that afford a broader exposure to the variety of troubles, challenges, opportunities and lessons that life has to teach. It’s impossible to say when it happens, and it’s probably different for everybody, but there comes a time when the time you’ve had provides you with an understanding of “how life works.” This is known as wisdom. To be “wise” or to have wisdom doesn’t mean that you’re smarter than everyone else, and it’s not about knowing things that are theological or metaphysical in nature. Wisdom is exquisitely practical and famously pragmatic. It involves using critical reason and making good judgments, giving attention to detail but also extracting general principles that can apply across similar situations. Whether you would consider yourself very accomplished at wisdom, or are the type that seems to need numerous sessions in the school of hard knocks before you finally “get it,” as an adult you have been through enough of life to have a sizable collection of observations and discoveries to draw upon. Drawing upon the lessons of life is the business of your higher self (or soul). Cultivating wisdom requires reflection, obviously, or else you would never stop long enough to pick up your lesson and carry it forward. We could add other supportive practices that enhance the cultivation of wisdom: introspection and mindfulness, self-honesty and humility, responsibility and forgiveness, being open-minded and willing to change your verdict should the evidence demand it. My symbol for wisdom is the sun, which is actually fairly popular across the cultures as representing clear-sighted impartiality and radiant understanding. Seeing as how wisdom is extracted from the churning stream of real experience, and how it lifts to universal validity certain truths that are purported to transcend the vicissitudes of time, perhaps this is also why the higher self is commonly regarded as immortal. Thus, you are a microcosm unto yourself. The myth-maker of your ego/inner child/fantasy spins out the stories that give your life meaning. Below is the dark force of your body/animal nature/instinct, dependable in its rhythms yet always urgent at the threshold to your tidy world. Above middle-world, resting quietly and detached on the dome high overhead, is your soul/higher self/wisdom. With the benefit of its elevated vantage-point you can survey the entire field of your present and past experience. Of course, your inner child must struggle with and can hopefully befriend your animal nature. And your higher self needs to gently persuade your inner child to rise above self-interest for the sake of self-actualization, to let go (just a little) of security for fulfillment, to break open the small horizons of your world in order to take in (just a little) more reality. Let’s get out our shovels. We are searching for the true meaning of Christmas – this season that rushes upon us and is as quickly gone again. Our quest will proceed on the analogy of an archeological dig. Christmas is a celebration of materialism. It is time to buy – before it’s too late. All the glitzy and gaudy trinkets, the Jing Tinglers and Flu Floopers, are brought out of storage to get us in the mood. Our credit card balance after the holidays is the lingering reminder that we got bamboozled once again. Just barely under the surface of this layer of Christmas commercialism is the figure of Santa Claus. He’s the one we’re waiting for, hoping he’ll bring us what we really want this year. Or maybe he’s the one we’re pretending to be as we swipe to satisfy the material cravings of our children. “Santa Claus” is an informal rendering of Saint Nicolas, which suggests that this genius of package delivery logistics is somehow (or once was) a religious notable. His backstory in folk tale and legend tells of his charitable endeavors in bringing cheer to orphans and children whose families couldn’t afford the luxury of toys. The giving of gifts brings us down yet another layer in our excavation of Christmas. We need to be reminded every year that it’s not the gift but the thought and love behind the gift that really matters. Back in the day, according to the Bible story, wise men from the east brought Baby Jesus their gifts of gold, frankincense and myrrh. Narrative detail would probably be more important to us had Christianity remained anchored in its foundational myths. As it happened, story gave way to theology, and abstract doctrines took over from the concrete narratives that shaped the earliest Christian experience. Stories are arranged in a system called a mythology; doctrines are arranged in a system known as orthodoxy. Stories appeal to the imagination, doctrines to the intellect. At the doctrinal level, Christmas is about the Second Person of the Trinity (the Son), the sinful condition of humanity, the “kenosis” or self-emptying of God in becoming human. The vehicle of this incarnational miracle was a virgin, whose status as “Christotokos” (Christ-bearer) made this a central doctrine not only for Roman Catholics but Protestants as well. Inside of story and deep along its root-line is metaphor, which is a way of representing something that eludes our conceptual grasp. Once the metaphor is offered up by creative imagination, our minds get busy weaving a meaningful pattern of storylines around it. Rather than thinking of eternity as an endless extension of time, or as another realm of existence separate from this one, imagine time as we (think we) know it moving like a horizontal stream in a “forward” direction. Eternity would be represented as a perpendicular line drawn straight down along the vertical axis. The place of this intersection is not itself part of the time-stream, but always NOW. It’s not that this present moment comes to us from the future, and neither does it recede into the past. It is timeless. Contemplating Mary and the universal metaphor of the Virgin Mother, we can begin to appreciate her value to mystics everywhere, by whatever name she is called. She is a literary symbol, a mythical archetype, and – in a celebrated paradox – the spiritual embodiment of those qualities that must be nurtured if you are to be fully present to the mystery. What qualities? Emptiness. The opposite of emptiness is not fullness, but preoccupation. Instead of relaxing the boundary of attention and expanding your capacity for awareness, your mind becomes increasingly cluttered. Real presence is available as you are able to drop assumptions (from the past), release expectations (for the future) and surrender all distractions. Humbleness. From the root-word humus, “humble” and its cognate “humility” carry the idea of being fully grounded. Not exalted or “full of yourself,” not inflated or disengaged from what’s going on, but fully here and now. Humility is a position of greatest strength, balance, and resilience. In the present moment you are grounded in the really real. Faithfulness. Having little or nothing to do with orthodox beliefs, faith refers to the act of entrusting yourself to the providential support of reality in this moment. Its opposite is not doubt, but conviction, which is not about opening up to mystery (as faith is) but closing down on meaning. Creativity. The creative life is not about “making” something of yourself or accomplishing great things in the eyes of others. You give a lot of attention and time to making money, making progress, making up, and making do. Creativity doesn’t flow along the conventional channels of effort, work and accomplishment. Instead it breaks into time through the portal of this present moment. I’m suggesting that while in the deeper layers Christmas might seem like it’s about something that happened a long time ago, the early Christian myth-makers were not writing history, doing theology, or just making stuff up. The Story is a creative composition, to be sure, but it’s more an exercise in mystical contemplation than anything else. Christmas is an invitation to get to a place where you are empty, grounded, and open to the real presence of mystery. Only then – when you are centered, quiet and receptive within – can the creative life truly begin. The revolutionary life of Jesus came through the contemplative preparation of Mary. It still does.